Prepare cakes according to instructions. Level each cake with a knife and spread one cake with some of the buttercream icing (see below). Sandwich the other cake on top to form the base. Ice the entire cake with the remaining icing. Cream butter for 1-2 minutes. Add the milk, vanilla , cocoa and half of the icing sugar. Beat for approximately 3 minutes. Add the remaining icing sugar and beat for another 3 minutes. The icing is ready to use immediately. Press white chocolate melts around the top of the bottom of the cake whilst the icing is still wet. This will help the chocolate to stick. Using a vegetable peeler, peel the block of dark chocolate to make little chocolate curls. Sprinkle this over the top of the cake to make the flower pot dirt. Thread two mint leaves onto each skewer. 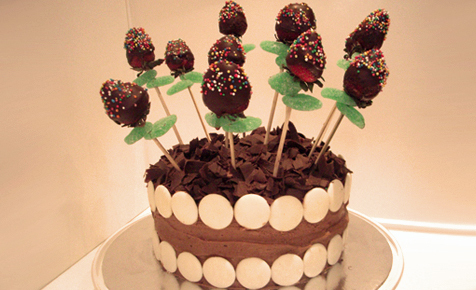 Position the strawberry ‘flowers’ on cake by poking one end of the skewer into the cake. Strawberries can also be dipped in white chocolate for a different effect. A dense cake needs to be used to support the weight of the strawberries if not using suggested packet cake. This recipe was created by Katherine Petric for Kidspot, New Zealand’s best recipe finder.